Today, let's talk about resistors and their power ratings. Resistors are possibly the most basic component of electronics; given an input voltage, they allow a current to flow, and given an input current to flow, they produce a voltage. The relationship between the voltage and current is linear (a straight line), (mostly) frequency independent (unlike capacitors or inductors), and only dependent on its resistance (expressed in ohms). The most common resistor is the 1/4W through-hole resistor. The more common style is that shown on the right, where the length of the body is concave with four or five colored bands indicating the resistors value. The resistor on the left is an older style where the body is a straight cylinder and formed from a darker colored epoxy. "Twinkle twinkle, little star. 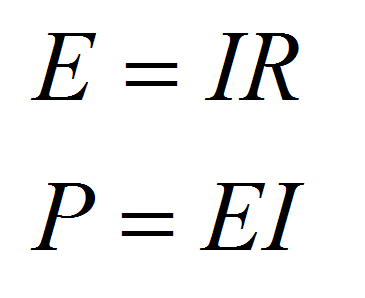 Power equals I squared R"
So great, but what does this have to do with our 1/4W resistors that we all know and love? Every electrical component has a maximum power rating, which is how much power the manufacturer claims it can handle before melting, exploding, catching fire, releasing its magic smoke, etc. Going on YouTube, it's easy to find countless demonstrations of components dramatically exceeding their power ratings. So why not just buy giant 100W versions of every resistor value you'll even need and never have to deal with these stupid power calculators or worry about stuff catching fire? Because higher power resistors get expensive, and big, fast. Often, when you're trying to get a project to fit inside your pocket or backpack or clothing, even 1/4W resistors will start being larger than you'd like, so it's not unusual to spend some time doing the calculations to see how small you can go. Shown is a 1/8W resistor below our handy reference 1/4W resistor. Surface mount resistors will get WAY smaller still (measured on the order of tens of thousandths of an inch long), with even lower power ratings still. Example: As seen in this picture, we have two 10k 5% (brown-black-orange-gold) resistors. We want to use these in a circuit where we know that they'll have at most 10V across them. Which, if either, can we use without having to worry about them catching on fire? 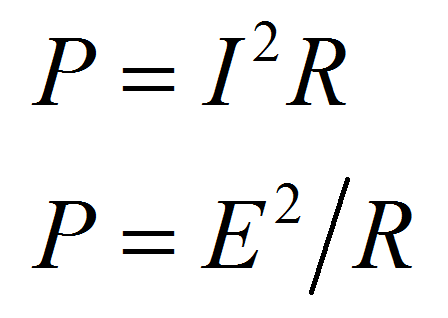 In the last form shown, power = voltage squared divided by the resistance, so 10V * 10V / 10,000 ohms = 0.01W = 10mW. Seeing as how these are rated for 0.25W and 0.125W, respectively, we can use either and never have to worry about them catching fire. On the other hand, if we later decided we needed to replace these 10k resistors with 1k resistors, running the calculations again show that P = 10V * 10V / 1,000 = 0.1W, which still technically is less than either, but 0.1W is getting pretty dang close to 0.125W, so that 1/8W resistor is going to start getting pretty dang hot and probably quite a bit less reliable. These power ratings are nominal ratings. When the manufacturer says that their resistors can handle 1/8W, they mean it can handle 1/8W in some specific scenario, usually involving 25C ambient temperature and unrestricted air flow around it for cooling. Leave something in a car, and ambient will rapidly go up, and lint, dust, and sleek packaging inevitably interfere with air flow around components. Exactly how close you can drive components to their specified power ratings will always depend on your specific project, but I generally try and keep them at least 25% away from their upper limits. Every engineer will have their own preferences on the matter, so don't bother trying to reach a consensus. So what happens when you realize that you really do need a resistor that can handle more than 1/4W? Well, you get a bigger resistor... OR, you build a bigger resistor using lots of smaller ones. Shown is two 1/2W resistors below our 1/4W reference. Notice how they're slightly larger, both in their bodies and in the thickness of their lead wires. This helps them by giving them more area to transfer heat to the environment through, and stay well below their critical catch-on-fire-or-explode temperatures. If you go someplace online like Digikey and poke around in their resistor catalog, you'll probably be able to see that 1/2W resistors are generally more expensive than 1/4W resistors, since people generally use less of them, they're bigger, etc. It's actually not unusual for it to be cheaper to buy several 1/4W and solder them together to make something that can handle 1/2W. If you see a lot of 1/4W resistors which all seem to be really redundant in a circuit, this very well may be why. Something to consider as we continue to talk about higher power resistors. Now we're getting up into some serious resistors. These are 5W resistors. You can see that the two on the left are made by cementing a resistive element into a ceramic channel. You'll also notice that this is the end of those silly color coded bands; high power resistors are usually large enough that you can simply print their values on. The black resistor is 0.25 ohms, and I plan to use it as a current sense resistor (since it can handle +4A, and will only drop 1V, which is an easy range to measure). Poking around in our electronics catalogs, you should notice that prices have now started to climb into the $0.25-$3 range. Compared to the 1-3 cents per 1/4W resistor, this starts to hurt, so you want to make sure you really need these high power resistors before you start throwing them in a project all willy-nilly. I'm not even joking. Incandescent light bulbs actually make great power resistors. It's not unusual in places like auto shops to find a 2x4 with a couple E27 light sockets and a set of jumper cables screwed to it, for load-testing lead-acid batteries. A 100W light bulb is expecting to be used with 120VAC, but all that means is that it's a (120V * 120V / 100W =) 144 ohm resistor that can handle 100W, which happens to get really bright when it gets hot. Buying a traditional 100W power resistor compared to going to Ace and buying a light bulb is a little silly (and very expensive) when you can get what you need with a network of 144 ohm resistors for a fraction of the cost. Granted, that's not quite right... (Thanks Mats in the comments for reminding me) Resistivity isn't constant over temperature, which is part of why using the proper power rating of resistor is so important. If you unscrew a 100W light bulb and put an ohm meter to it, you'll get something more in the range of 10 ohms. Rather odd, until you consider that tungsten has a positive thermal coefficient of resistivity. As soon as you turn it on, the metal filament gets hot and the resistance very quickly rises to the 144 ohm level you'd expect. If you think about it, this is why you usually see light bulbs fail when you first turn them on. For one project, I did need a high power resistor that didn't make much sense to build from light bulbs, so it was time to bite the bullet and buy some serious ceramic wire-wound power resistors. That is four 2 ohm 20W power resistors wired in series-parallel, such that together they still make 2 ohms, but divide the power load between them (two 2 ohm resistors in series make a 4 ohm resistor; two 4 ohm resistors in parallel make 2 ohms again, with 1/4 of the power dissipated in each resistor). So by putting the four of them together, we get an 80W resistor! But even that wasn't enough power handling capacity to load-test the traction batteries I was working with. That liquid they're sitting in is mineral oil, which does a much better job of removing heat from these resistors than air, keeping them below their catch-fire temperatures (at least for long enough to meet my needs; the oil eventually gets just as hot and then you're in a world of hurt). In the end, this means this 2 ohm resistor can handle quite a bit more than 80W; exactly how much more is a complicated question, but applying the ever-useful engineering saying "when in doubt, make it stout," I'm pretty comfortable saying that this can probably handle the ~100W I needed it to. Of course, even this behemoth mason-jar-resistor can be dwarfed by many power resistors, which can grow to the size of a roll of paper towels for really high power needs. In the past, I've worked with power resistors the size of your forearm in the 64VDC electrical system of diesel-electric locomotives. The resistance of a common lightbulb is about 10-15 times lower when it is cold. So don't expect your 100 watt ligtbulb to behave like a 144 ohm resistor at lower voltages than 120 volts. Good point. I usually use them to test 64V lead-acid battery packs, so the thermal coefficients aren't as big an impact, but you're right. At 20C, instead of 144 like you'd expect, it's actually around 9-10. It still amazes me how tiny a resistor is, but it has a huge impact on everything it is used in. Nice article, lightbulbs are indeed a nice low-cost load but not very stable (in resistance value). For some tests I had to do with a 90ah lithium battery I used to build power resistors myself by winding bare copper wire on an insulating cylinder and submerging this in distilled water. This way I managed to build a power resistor of a kiloWatt for just $20. The nice thing was that it even was quite stable, it didn't change more than a few % in resistance during the tests.